You probably know that there are different kinds of players. Some opt for a defensive style, and then, you have those who prefer to attack over and over again. And for that kind of player the Yonex Arcsaber Z Slash is a wonderful choice. This lethal killer comes with all the features necessary for a serious attacker. It’s fast, precise and powerful. What else could you ask for? Let’s check the pros and cons of this racquet, so you can see its strongest and weakest points. As you can see the Yonex Arcsaber Z Slash is packed with tremendous power, an outstanding control and superior maneuverability. These are the elements that make it an excellent Yonex badminton racket, one of the best ever created for attackers. Want to know more about it? Then just come with me in order to read a more detailed review, so you can understand why this racquet is such a wonderful choice. As always, it’s important to review the design and construction of this racket, because this is what will bring us a clear notion on why it performs like it does. The design like all other options in the Arcsaber category is pretty good. It looks powerful, modern and the combination of colors is pretty good. First off, unlike the Arcsaber 11, its head is heavier. Therefore, it has more power which is perfect for attackers. In this aspect it’s similar to the Voltric 80 or Voltric 70. The repulsion is excellent thanks to the CS Carbon Nanotube. This cutting-edge piece of technology allows your racket to retain the shuttle longer than average, which rewards you with more accurate and powerful shots. Moreover, the Super High Modulus Graphite in the side of the frame will bring you even more repulsion power. You wanted the perfect attacking racquet, and here you have it. An excellent stiff shaft thanks to Ultra PEF. It will bring you excellent precision, plenty of power and superior accuracy thanks to the outstanding shock absorption. Say good-bye to trembling rackets! Say good-bye to torque with its built-in T-joint. If you are tired of rackets that cannot control torque, then be happy because the Arcsaber Z Slash will handle it thanks to its strong and highly durable built-in T-joint. Superior maneuverability thanks to Control Support Cap. Want fast swings and outstanding maneuverability? Then thanks to this feature which provides you an 88% wider flat surface you will be able to enjoy it. And finally, thanks to the isometric frame shape and the enlarged sweet spot, you will have an easy time hitting successful and precise shots. What else could you ask for? From this point of view it should be easy to see why it’s such an excellent racket. But now let’s go to review its performance in the game, by reviewing how well it plays in different parts of the court and specific shots. It’s time to review its performance during the game, so you can see why this fabulous technology will bring you superior results. If you are tired of weak servers, then this racket will put an end to it. It works very well when serving, even with backhand serves. The same goes for flick serves. All in all, it’s an excellent racket in this aspect. Drives are very important to any attacker, and you should know that this racquet is excellent with both backhand and forehand drives. You will be able to execute them easily and with plenty of power. Needless to say, it’s an outstanding performer when it comes to smashes. 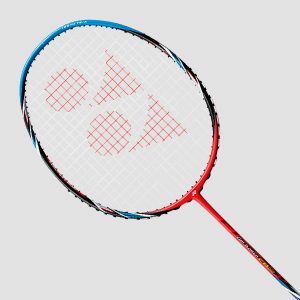 It puts it up to the level of several excellent rackets like the Voltric 1DG or Voltric Z Force II. With this racket clears go smooth and easy. It feels like you are not doing much effort at all, and what makes it even better is that they go with plenty of precision. It should be easy to see now why the Yonex Arcsaber Z Slash is such one of excellent badminton rackets. It’s the perfect choice for attackers as it brings you tremendous power, superior control, excellent maneuverability and an outstanding performance in shots like drives and smashes.